Since the first description of laparoscopic nephrectomy performed by Clayman et al. 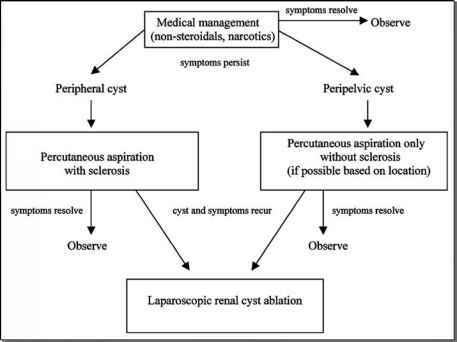 in 1990, there has been great enthusiasm for employing endoscopic techniques to treat renal disease processes (1). The natural progression from treating benign disease states to more complex malignancies has followed. In fact, in 2004, the majority of renal tumors are treated laparoscopically. The transperitoneal approach was the first and, by many accounts, the traditional approach in addressing renal tumors. Where there was debate in the past on whether an adequate cancer result could be obtained with laparoscopic technique, long-term follow-up has shown that laparoscopic intervention produces reproducible and acceptable results with regard to cancer control (2-7). Laparoscopic nephrectomy also results in decreased postoperative pain, a reduction in analgesic requirement, a decline in hospital stay, and a quicker overall recovery (2,6,8-10). The indications for performing a radical nephrectomy have also been refined. Many smaller lesions today are treated with laparoscopic partial nephrectomy with excellent long-term disease-free survival rather than proceeding with complete organ removal (11-14). The indications for performing a laparoscopic radical nephrectomy include solid and complex cystic renal tumors that are not amenable to partial nephrectomy by size criteria, location, or multifocality.Larger lesions and those involving the main renal vessels represent technical challenges with a higher conversion rate to open surgery. In the early published series of laparoscopic radical nephrectomy, a tumor size of 8 cm was a relative cutoff. In reality, larger lesions and, in fact, many complex and bulky lesions can be addressed laparoscopically (15). There are many attractive aspects of laparoscopic nephrectomy in the setting of renal cell carcinoma. The majority of patients who present with this disease state are elderly with comorbidities including pulmonary and cardiovascular disease. With the absence of a large flank or abdominal incision, patients tend to recuperate faster and frequently there is less postoperative exacerbation of underlying diseases such as chronic obstructive pulmonary disease due to decreased postoperative requirement of narcotics.